"A guide for rail fans in Northern Colorado". We went back to the car and started driving up over La Veta Pass. The weather got bad and it started to snow. On the other side of the pass it was real windy and cold when we rolled west on hwy 160 towards Alamosa. West of Fort Garland we saw a headlight and turned left at the next gravel road. We stopped at the railroad track and Roland took one shot of the approaching train. The power consisted of D&RGW 3096, SSW 7273, D&RGW 3080, SP 7124, SP 7131 and D&RGW 3107. We counted 37 freight cars in the train ahead of D&RGW caboose 01522. We continued to Alamosa and checked in at the Lamplighter motel. We drove out to the K-mart on the west side of town and purchased more film as our supply was getting real low. On the way back to the motel we filled up the car with gas so we should be ready for whatever was going to happen next day. We walked over to a Mexican restaurant on Main Street a couple of blocks from the motel. After dinner we went back to the motel and fall asleep early - it had been a long and exhausting day. We got up at about 5.30 AM, got dressed and headed for the Alamosa yard office. The same six units we saw yesterday arrived 6.09 AM after dropping off the cars at East Yard. We talked to the crew and heard that the trip over the pass had been fine. We were informed it would take at least one hour before the local crews would go to work. We went to Efrem's Restaurant for breakfast and had the $ 2.99 special consisting of a tortilla, refried beans, two eggs and toasts or biscuits. The train crew had recommended the place to us and we were pleased with it. We were less pleased with the weather as it was rather gray. It snowed most of the day and we found best weather up in Center. We got some pretty good pictures of SLC 71 - a 70 ton General Electric switcher built in January 1955. San Luis Central normally use their SW8, SLC 70. We heard that the SW8 had broken down and they would use the old GE locomotive until the SW8 has been repaired. We photographed SLC 71 both at Sugar Junction and Center. 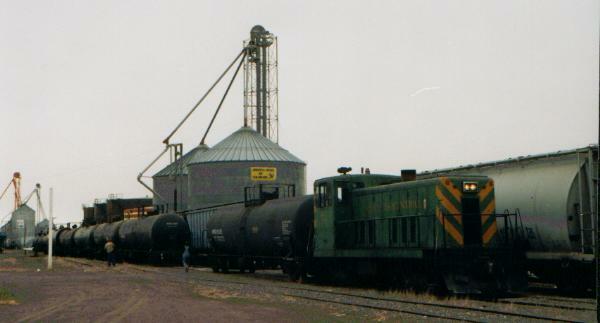 Tank cars with liquid fertilizer were being unloaded at Center. We also watched SLC 5033 being filled with grain . 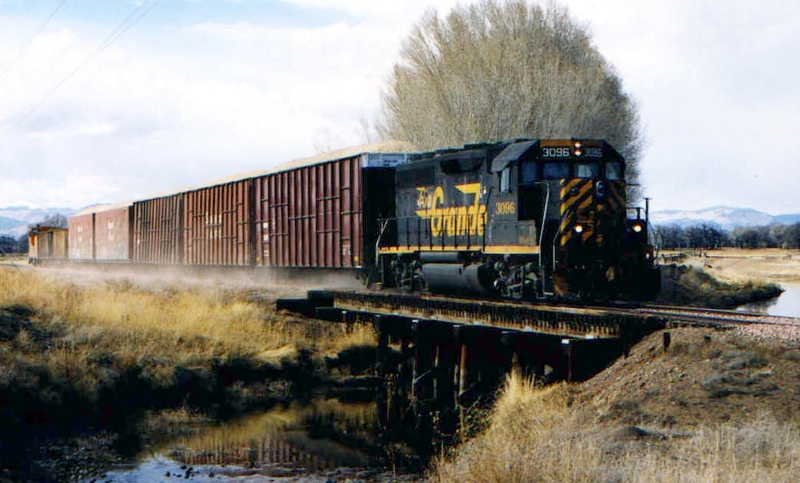 SLC has a sizable fleet of freight cars, a total of 833 cars according to the January 1999 issue of ORER. I find it especially interesting to watch their mechanical reefers and see the previous owners logos barely covered with almost matching paint. Their covered hopper fleet consists of both Canadian style cylindrical cars and rib side covered hoppers, mostly Trinity built 4750 cuft cars. Roland spent a lot of time checking and correcting his drawings of the tracks and adjacent buildings. This will probably be the most interesting part of his model railroad. 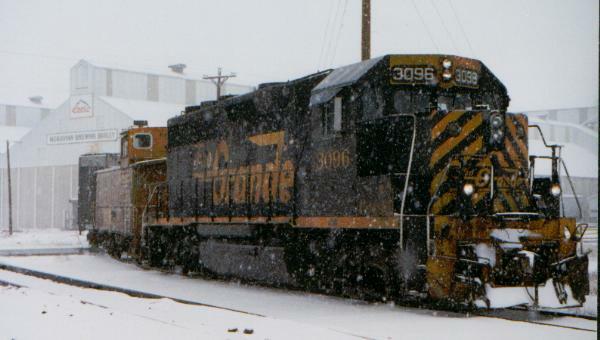 We moved on to Monte Vista and caught D&RGW 3096 switching the Coors Moravian Barely facility. With the snow falling heavily we moved a little bit further east to Parma. Here I photographed some tank cars while waiting for the local coming back from Monte Vista. The sun came out and quickly melted away the thin layer of snow on the ground. D&RGW 3096 appeared with 20 mechanical reefers (loaded), 22 empty tank cars, one empty covered hopper (had been loaded with fertilizer) and D&RGW caboose 01423. At Alamosa the sky was gray but we took a few shots of the power leaving town at 3.43 PM to pick up the train at East Yard. 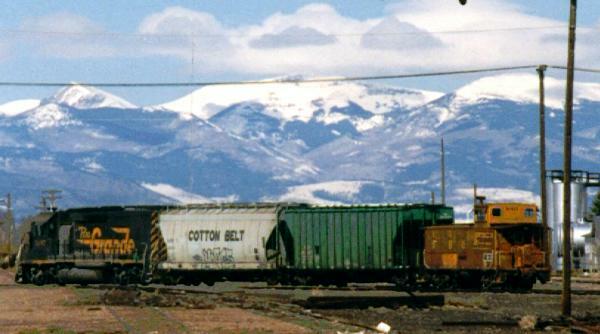 AMPUM (Alamosa Pueblo Manifest) left East Yard 4.22 PM with 20 mechanical reefers, 3 loads of wood chips, 12 covered hoppers and 5 empty tank cars. Left at the yard were 5 covered hoppers and 26 empty tank cars. They must have taken 11 cars up from Antonito if we made our calculation correct. We went back on hwy 160 and made our next stop at Fort Garland to photograph a trio of D&RGW freight cars parked there. The nicest car was D&RGW 63325, a 50 ft double door box car with diagonal roof and 3-3-1 ends. We also photographed a gondola, D&RGW AX-55539. The third car at this location was a 40 ft box car still fitted with running board but the entire car was so rusty that we could not identify it and hence refrained from photograph it. We desired to photograph the entire train at a scenic location so we went to the S curves visible from hwy 160 a little south of the entrance road to Forbes Park. We took a couple of shots of the approaching train from the highway. Poor light and falling snow caused the photos to turn out below average. It was however a nice experience to watch the train meandering up the hill with all six engines in full throttle. We went back to Alamosa and filled up the Chevy's gas tank and our, by this time, empty stomachs. We got up early as usual and drove over to the yard office. Great weather but not a locomotive in sight! Roland went inside the yard office and talked to a man named Jerry. He said that the train was delayed and he estimated that the power should arrive at 8 AM. We went to Efrem's Restaurant and had breakfast. After breakfast we examined the yard in Alamosa. Roland updated some details on his track plans and maps over Alamosa. At 8.01 AM the power from PUAMM (Pueblo Alamosa Manifest) arrived at the Alamosa Yard Office. D&RGW 3107 picked up a caboose and left for East Yard at 8.30 AM. 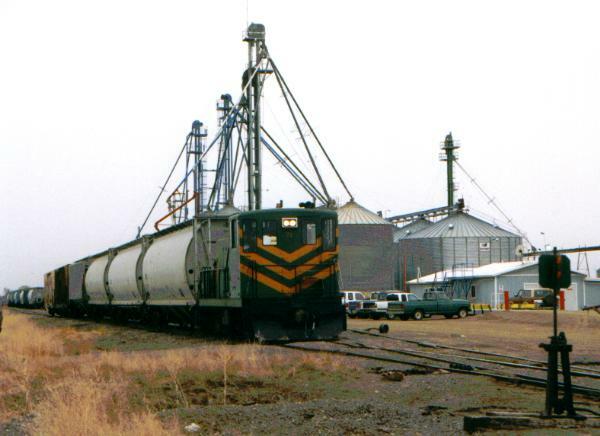 Five covered hoppers were picked up at East Yard and three of them were left at the new cement facility located where the engine facility used be in Alamosa. D&RGW 3107 continued with the remaining two cars towards Antonito. The South Fork Turn went to work at 9.30 AM when they turned D&RGW 3096 at the wye and went to East Yard and picked up 4 empty woodchip hoppers, 10 mechanical reefers and 2 D&RGW ex-covered hoppers (16312 and 18263) rebuilt for ballast work. 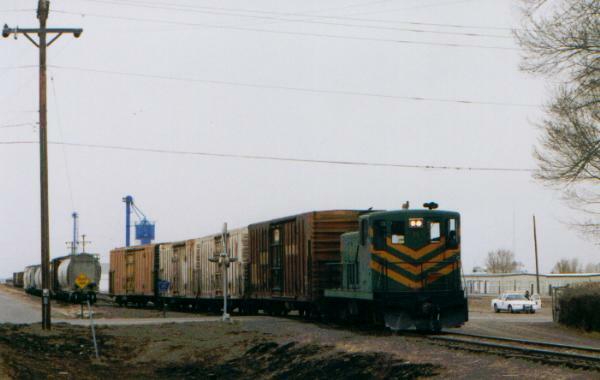 The mechanical reefers were set out at Sugar Junction and the rest of the train continued towards South Fork. They stopped to dump ballast on both sides of the trestle over Rio Grande and Piedra Valley Canal. Further west, we photographed D&RGW 3096 by the Del Norte depot and later by Bill Chappell's ranch approximately 5 miles east of South Fork. The train arrived at South Fork just after 1 PM and set out the empties and picked up 5 loads of wood chips. The engine was turned on the wye at Derrick, just west of South Fork. Without wasting any time they reassembled the train and left South Fork at 1.50 PM. 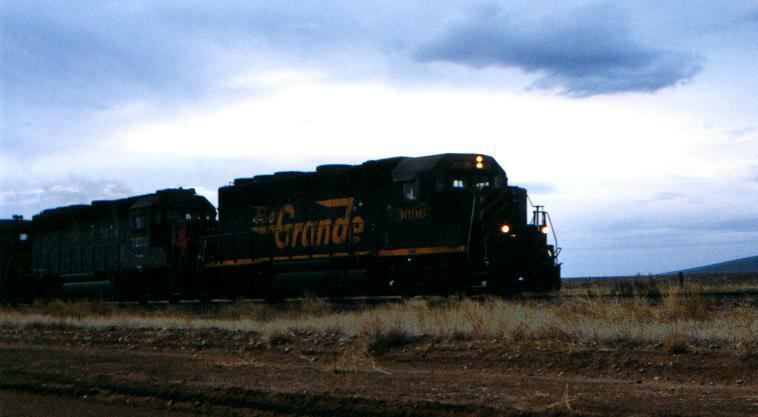 We photographed the train a few times on the way back; at Hanna, west of Wilson's ranch, at the trestle over Rio Grande and Piedra Valley Canal (MP 274) and in Monte Vista. At Sugar Junction they picked up 8 tank cars, 2 mechanical reefers and 10 covered hoppers before heading back to East Yard. At 4.35 PM they were done putting together the cars for AMPUM. The "La Veta Turn" had taken all cars left at East Yard the previous day to La Veta. We realized that we were not going to have an opportunity to get any pictures of the train leaving the valley as the power was not back yet. The light was getting worse and worse. We left Alamosa and saw the engines from the "La Veta Turn" west of Blanca at 4.55 PM. AMPUM would hardly leave Alamosa before 5.30 PM and the train would probably not reach Pueblo before midnight. Here I want to put in a section written by Roland: "The best part of the trip was the two days down in the San Luis Valley. If you would like to feel how it was when Rio Grande still was an independent railroad you should go to the San Luis Valley. They use 6 diesels on the train between Pueblo and Alamosa. During the two days we visited the valley the consist included three D&RGW GP40's, 2 SP GP40s and one Cotton Belt GP40. One Rio Grande unit on each end. Both of them were used on the locals in the valley. D&RGW 3107 was used on the Antonito local and D&RGW 3096 for the Monte Vista/South Fork Turn. Both locals also featured a D&RGW caboose. 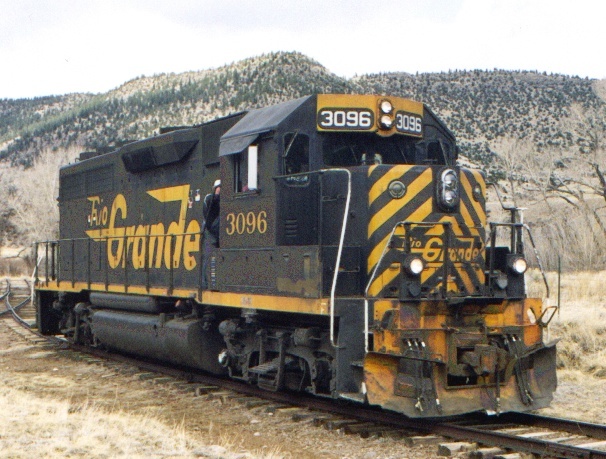 Can you ask for more than a train consisting of a Rio Grande GP40 with 2 to 45 cars and a D&RGW caboose? We talked a lot with the men working for UP in the valley. They are friendly and curious when they find rail fans in the valley. They told us that UP has investigated the traffic in the valley and found the line to valuable to sell. UP has even started to do maintenance work on the line up to South Fork. During our visit they dumped ballast between Monte Vista and Del Norte. Traffic has increased since our visit to the valley almost exactly a year ago. They have started to ship woodchips from Stone Forest Products in South Fork again. There is a new cement facility in the Alamosa yard close to where the roundhouse used to be. They have built some new tanks for urea in Center. Around 50 to 60 cars (mostly empties) per day are coming into the valley in the beginning of the week. AMPUM is leaving the valley with maximum load (about 40 cars) every day. During the week we visited the valley they did at least one turn to La Veta. The San Luis Valley can give you some warm Rio Grande feelings even in 1999. Rio Grande diesels and cabooses. It can't be any better. Go to the valley before it is too late. I will try visit the valley again next year even though I have collected all the information I need for my model railroad project." What can I say? I also enjoyed the visit to the San Luis Valley but my heart is up in northern Colorado at the Great Western Railway. We drove through clouds when we went over La Veta Pass. At Walsenburg we entered I-25 which took us to Pueblo. We found a cheap motel on the north side of Pueblo and had big steaks for dinner a few blocks north of the motel.